Crosley Portfolio Quatzal is the best USB home & portable turntable on the market. 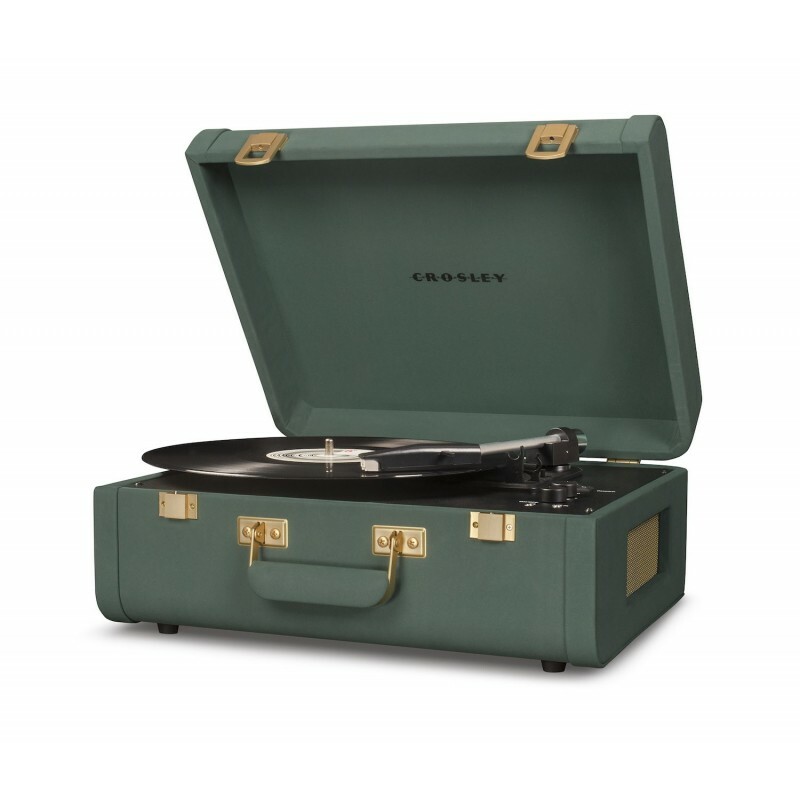 Crosley created its Crosley Portfolio collection by combining a top-quality turntables plate derived from models such as the bermuda, which includes asynchronous belt-driven drive and an Audio-Techinca diamond cartridge (in the version distributed by Nicole design store), and most popular turntable-style design of turntables in vintage style and phonovalige. Quality finishes, faithful reproduction and powerful speakers reach the perfect mix in Crosley Portfolio Quatzal. Crosley Portfolio collects the best of Crosley know-how when it comes to portable turntable. 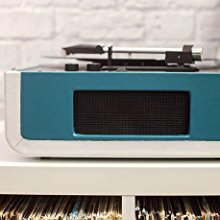 In Crosley Portfolio we see the quality of the turntables developed for Crosley Nomad and Crosley Bermuda combined with the most popular and recognizable Crosley Cruiser design. All the Crosley brand products distributed by Nicole design store, including the new Crosley Portfolio Quatzal, have a power supply and plug made specifically for both Italian and European market, without any need for adapters or other modifications as well as being covered by the 12 month Crosley International Guarantee from the Official Warranty for the Italian 24-month market issued by us at the source of any purchase made at our store or this portal. Thanks to a complete experience in hi-tech products, from photography to audio video, we guarantee a quality service and an infallible availability via email, WhatsApp, Telegram, Facebook Messenger and Phone. 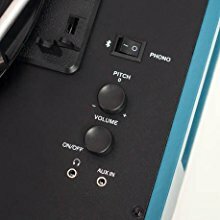 Among its features, each Crosley Portfolio case-turntable includes Bluetooth, Pitch Control, USB, 3.5mm Aux-In input, RCA output and 3.5mm Aux-Out output. The above means that you can conveniently use your Crosley Portfolio to listen to your vinyl records 33, 45 and 78 laps from the integrated speakers, but also to import tracks from them on the PC or to listen to the music of your smartphone / MP3 player or, again, use your Crosley Portfolio Quatzal as a simple turntable deck as a source for your stereo / hifi system. Made entirely of wood, in this "Quatzal" edition, your Crosley Portfolio boasts chrome metal details and an exclusive faux leather finish that covers all exterior surfaces and the handle. Inside you will find the base on which the turntable plate painted in opaque Quatzal stands and the cover lined with cream-colored velvet effect fabric. 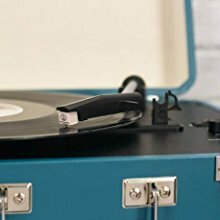 Included in the package you will find the power cord, an additional RCA connector, the Audio-Techinca diamond needle and the adapter for the 45 rpm: just open the package and you will be enveloped by the warm sound of your favorite vinyl. Thanks to the magnetic diamond needle included and pre-installed by Nicole design store, Crosley Portfolio gives you one more reason to be your next turntable. 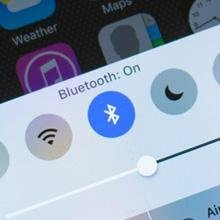 You can connect you iPod or Smartphone vi aBluetooth to use Crosley portfolio's own speaker for listening you favourite music. Crosley Portfolio com with two dynamic full range stereo speakers. Pin and Strap are also available as an official spare part.